Let’s face it, social media is entertaining. As communicators, we really do need to think through the consequences of using digital. But sometimes, the best of intentions just aren’t enough. Companies who don’t think through the reasoning behind their campaigns will face a backlash online, including derision, contempt, and abuse. There are many examples globally of hashtag hijacking; possibly the best is McDonalds and its #McStories campaign. Fortunately for us in the Middle East, we now have our own example of how not to launch a hashtag on Twitter. A couple of days back the Abu Dhabi-based telecommunications operator launched an advertising campaign called the #EtisalatChallenge. The idea is simple enough – Etisalat challenges consumers to find offers and prices that are better than their own and they’ll match or beat that offer. You will literally see the below advert everywhere across the UAE at the moment. Are you ready for the #EtisalatChallenge? Now, there’s a couple of issues here. The first is pretty basic; the UAE’s telco market is a duopoly. Both operators are government-owned and there’s not much in the way of competition when compared to other. The second is Etisalat’s reputation. The company isn’t the most consumer-friendly in terms of its support. Shortly after Etisalat launched its hashtag #EtisalatChallenge (complete with a huge marketing campaign), the hashtag itself was taken over by customers complaining about high costs and poor service. My #EtisalatChallenge has been getting stable DSL with no dropouts for the past three weeks. What's yours? Despite the obvious backfiring of the campaign (and, as you can see from the tweets below, the campaign has been taken over by negative sentiment), Etisalat has persevered with the #EtisalatChallenge. 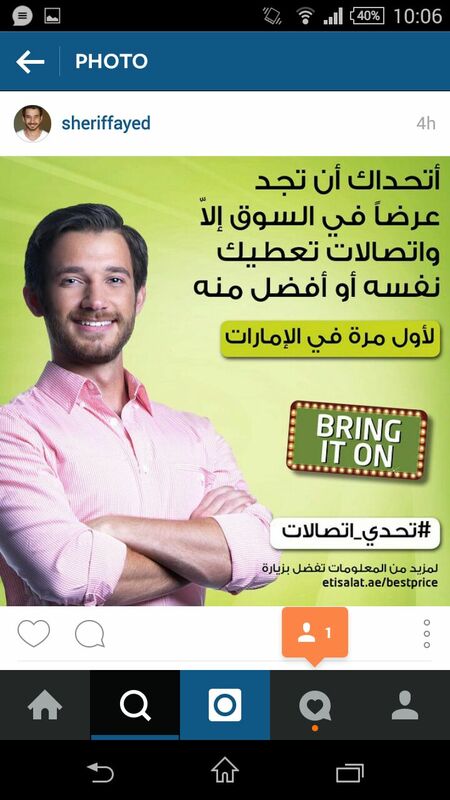 The #EtisalatChallenge hashtag is backfiring! What’s even stranger is the number of bots, of Twitter accounts which are automated which have are now tweeting the same message about the campaign. 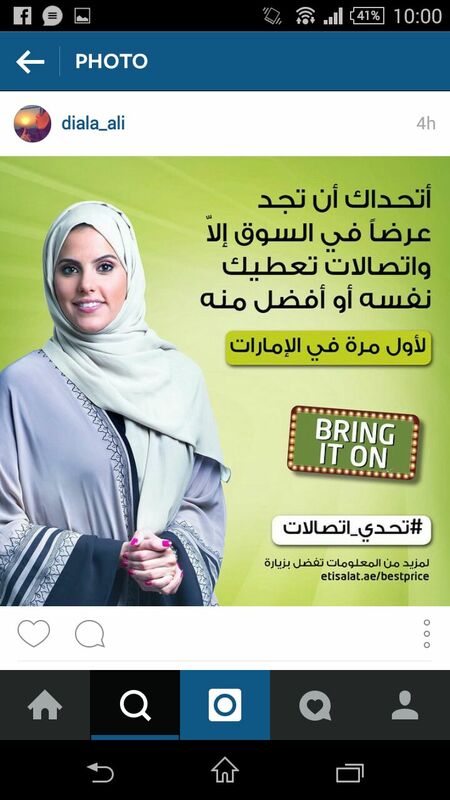 The other element of the campaign which is intriguing is the number of celebrities that Etisalat has brought in. There is one of Scotland’s finest, Gerald Butler, Bollywood actor Hrithik Roshan, and Filipina actress and singer Lea Salonga. 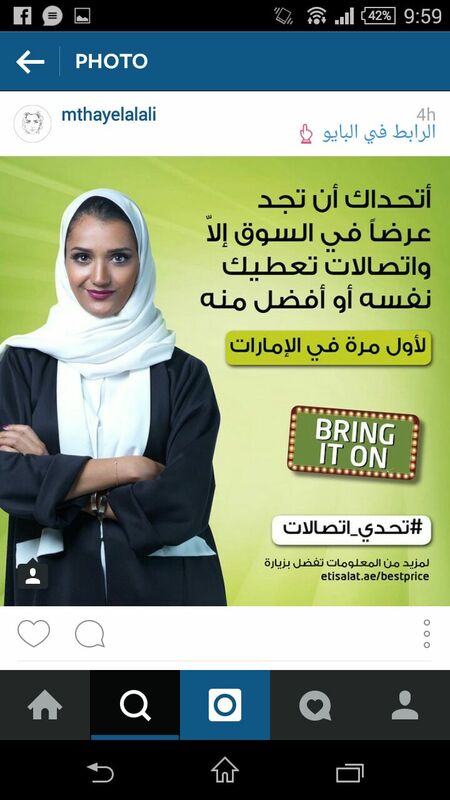 Etisalat has also paid a number of the UAE’s leading social media influencers. While the use of social media influencers to support marketing campaigns is becoming standard practice, the #EtisalatChallenge in unusual in that many of the influencers have previously worked for the UAE’s rival operator Du. Have a look below. 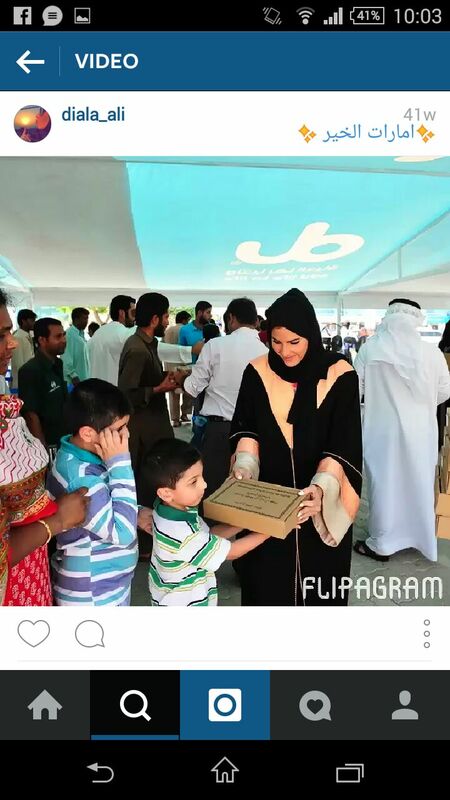 Before her support for the #EtisalatChallenge UAE media personality Diala Ali was a Du supporter. While one can easily fault Etisalat for getting out the cash and spending a fortune on social media endorsements, these online influencers are more to blame in my eyes. They’re doing their own brands more harm than good by changing from one corporate brand to the other so quickly. Their authenticity is at stake, and for someone who runs a social media agency Mthayel Al Ali should understand that authenticity matters to fans, and fans are the reason these people are paid to endorse brands. There’s little long-term thinking from influencers who have worked with Du previously and whom are now working with Etisalat. Going beyond the pains of creating corporate hashtags (which, in this case clearly don’t work), what was Etisalat thinking? And what is it still thinking, seeing as the campaign is failing so badly? Come on, share with me your #EtisalatChallenge! This entry was posted in Marketing, Public Relations, Social Media, Technology, United Arab Emirates and tagged #EtisalatChallenge, crisis communications, Du, Etisalat, hashtag hijacking, hashtag marketing, social media influencers, social media marketing, telecommunications, twitter, UAE by alexofarabia. Bookmark the permalink. Reblogged this on Balaji TS' world-view of telecom. I look forward to reading and learning more from your work. As always, love your comments Sheikh. And keep up the blog! The more you write, the better you will become. I’m enjoying reading your work! That’s extremely encouraging, Alex. Wouldn’t have imagined getting this review from you when I first started following your blog. I really appreciate it. Will certainly write more and hopefully garner your feedback and review if possible. Thanks a ton! Pingback: The real #EtisalatChallenge: Where are the eGlobe cards?